It might be raining or the wind hard blowing, or it might be snowing. For whatever reason, you can’t always use the outdoor barbecue grill. But when the urge to make something with that out-of-doors savor, these oven-baked chicken skewers come close to giving that patio party feeling. The bright and distinct colors of the skewers always remind me of the pictures I’ve seen of Hawaiian luaus and they taste great. Blend sauce ingedients in blender. Warm in saucepan. Place 16 - 18 wooden skewers in water to soak. Cut chicken breasts, lengtheise, into 1-inch strips. Cut across to make cubes. In blender, buzz marinade ingredients to combine. Pour marinade into glass bowl with cover. Add chicken cubes, toss to cover thoroughly. Marinade, in refrigerator for 1 hour, tossing once or twice. In large bowl, add green pepper chunks, mushrooms and tomatoes. Drizzle with olive oil and toss to coat. Allow excess oil to drain. In large bowl, add dredge ingredients and mix thoroughly. Remove chicken from marinade and discrad marinade. Dredge chicken pieces in flour mixture, shake off excess flour. Place on wax paper covered cookie sheet. Refrigerate 30 minute to set coating. 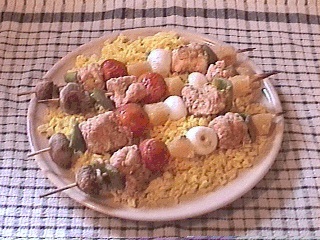 Skewer items, alternating chicken, pineapple, green pepper, tomato, onnion and mushroom pieces. Place skewers on a non-stick sprayed cookie sheet. Bake in preheated 425°F oven for 20 to 25 minutes or until golden brown, Turn once during cooking. After removing from oven, brush both sides with heated dipping sauce. Serve over a bed of saffron rice with remaining heated dipping sauce on the side. *Pat's Special Blend Hot Sauce is a family recipe of my sister, Pattie Knapp. If you are not lucky enough to have any, you may substitute 1 teaspoon Tabasco® Sauce.